The USGS monitors, assesses and issues warnings of natural hazards, including earthquakes and volcanoes. In the past month alone, a magnitude 8.0 earthquake shook Peru, Alaska’s Pavlof Volcano began erupting and lava started to flow from a new vent that formed in Hawaii's Kilauea Volcano. 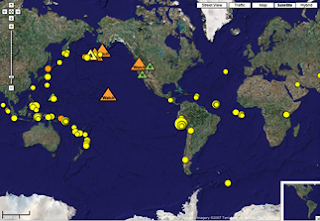 Now you can track both real-time earthquakes and volcanic activity on Google Maps using the USGS Mapplets. The Earthquake Mapplet plots the past week of earthquakes around the world, showing the location, time and magnitude. Each earthquake includes a link to the USGS earthquake website for more information, including additional parameters, background and other content such as Google Earth KMLs, ShakeMaps (shaking intensity maps) and "Did You Feel It?" maps. The Volcano Mapplet displays the latest U.S. volcano updates, showing the current level of both ground-based and aviation hazards. Clicking on an alert icon provides a summary of the volcano update along with a link to the USGS Volcano Hazards Program website for additional details and images.